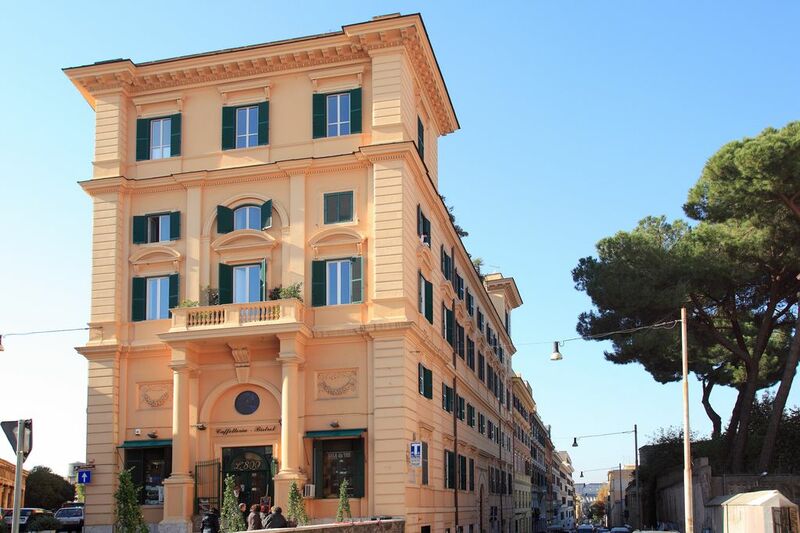 Housed in a historic building, once the outbuildings of the Basilica and the Lateran University, the apartment can comfortably accommodate ten adults, offering any kind of comfort. Elegantly restored, it was nice furniture because the emotion of beauty characterize the stay of the guests were kept the original features, enhanced the parquet floors and high ceilings, restored antique furniture, houses a collection of paintings by modern artists. The apartment has air conditioning and two internet stations free, consists of two double bedrooms, three double bedrooms, kitchen with dishwasher and dishwasher, three bathrooms, one with shower, one with shower and a washbasin. Location is the name of the game ! Great location, under 10min to Metro, 5min to tram, 12min brisk walk to Colloseum. Cafes and markets with necessities right around the corner. The bedrooms were fine, upstairs 2 bedroom only suitable for youngsters, we had 7 kids with us so perfect hideout for 4 of them upstairs. As for quality of the rooms it's not perfect, don't expect high or even medium quality hotel stay. However if you have a large group and you have kids who you want to spend time together then this place is great ! The restaurant recommended by owner was very friendly and rather inexpensive considering this is in touristy area. We ate there once and then tried another place right next door which we actually liked very much as well. We would stay again with large group but if you don't need to accommodate that many then there should be better quality options for you. The property discription doesn’t tell the whole story, the two upstairs bedrooms have no doors on them which means there is no privacy. One of the upstairs entrance is only about 5ft high which means you have to stoop down to go through it. On the other hand the other part of the apartment was splendid and very clean, it is also situated in a great area for all amenities and metro. We also had to pay €126 euro on arrival for city tax. Also the spiral staircase is not very wide and would not be suitable for large people. Great location and ideal for our trip. The stairs and the upper floor bedrooms are not for the big or tall. Recommend this accommodation though. Thank you Vincenzo. Apart from the photo of an impressive and imposing building we did not know what to expect. We were delightfully surprised by the friendly informative welcome and the excellent facilities decorated with art works in the charming fashion of a bygone era. The children loved the upstairs bedrooms which they totally made their own, giving the adults some great quiet time. The location was perfect with only a ten minute walk to the coliseum. All in all, I do not think we could have found any accommodation more suitable for two families with children, looking to explore Rome. Vaulted ceilings and art work were beautiful. Close to the Colosseum, restaurants and transportation. Use the Colosseum as a reference and never get lost. Only 4 of us used this great union, but 8 would fit comfortably with plenty of room. Nice apartment in an off the circuit neighborhood, but close to everything. We stayed with another family, so 11 people in total (kids ages primarily 6 to 9), and it was a great place for families and kids. The top floor (accessible by spiral staircase) is great for kids as the ceilings are low, but it made the kids feel like they had their own little apartment. Very small kitchen, but worked just fine as we only ate breakfasts at home. They were very accommodating in meeting us to help us find our way to the apartment initially. Also had a great family restaurant recommendation, which we went to twice. It's about a 15 minutes walk to the Colosseum (and a 24 hour mini supermarket), and 10 minute walk (opposite direction) to the Orange line (Manzoni), which gets you over to the Spanish Steps and Vatican very quickly, under 15 minutes or about 8 or 9 stops to Vatican. It was really well suited for our family and friends, and would recommend it. Our house-museum is located in the historic heart of Rome, among the glories of Imperial Rome and the monumental works of the Holy Roman Church, the Roman Forum, Colosseum, the Domus Aurea, the Basilicas of San Giovanni, the Scala Santa and San Clemente are within walking distance ..
Several bus lines and nearby (200 meters) underground station A and B available for visiting the city.